Tucked away in Mexico, between Cancun and Belize and overlooking the Caribbean Sea, you will discover the breath-taking beach houses of the Papaya Playa Project. This fully sustainable resort has been designed with barefoot luxury in mind. A place for you and your loved one to while away the days, lose all sense of time chilling, partying and being pampered to within an inch of your life! In between soaking up the southern Mexican sunshine on the idyllic beach, you can eat the best, Mayan-influenced cuisine imaginable at the beach club restaurant’s two spacious oceanfront palapas or up on the 360° wooden tower. 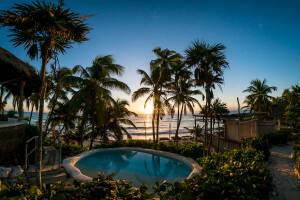 Back at your beachfront apartment, you can relax on the casitas and cabañas, private porches and plunge pools, where hammocks gently swing guests into sync with Tulum’s laid-back rhythm ‘betwixt the jungle and the sea. Tell me more about the Papaya Playa Project! This green-powered sanctuary offers much more than just your average retreat holiday. 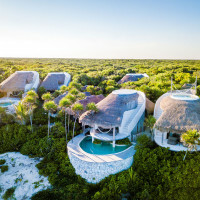 The first thing you’ll notice is the rooms and beach houses are built using the traditional Mayan “Chukum” cooling technique. The interiors are all designed with local traditional materials and textiles used by the Mexican natives lending a boho-chic feel. In the daytime, you can enjoy beach activities such as kite-surfing and Mayan Pottery classes. while being served light food and drinks, accompanied by easy, funk and soulful music from the extensive playlists of resident and guest DJs. At the weekend, DJ’s and bands rock the beach house with full moon parties. For the healthy and spiritual among you, there’s a health corridor which offers full spa-clinic, yoga, raw speciality food, juices, vegan tacos and which features artists, well-known musicians and holistic and alternative medicine practitioners. If this all sounds heavenly, then you can thank Mother Earth in a traditional Temazcal thanking ceremony. 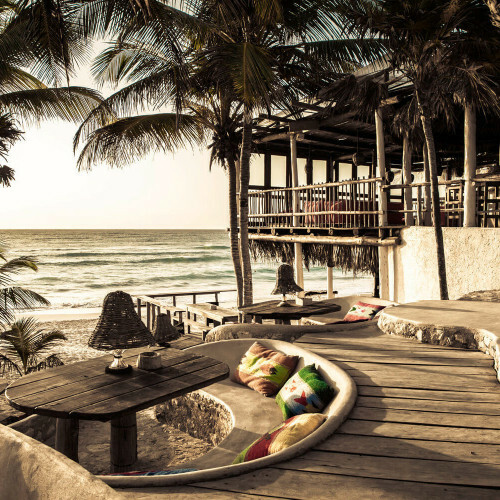 Papaya Playa Project is perhaps Mexico’s most romantic spot!